C# property is a member of a class that allows the class to expose some functionality without exposing the implementation details. This article explains what a property is in C#, why we need properties, and how to implement properties in C# and .NET. I am assuming that you already know how to declare a variable and assign a value in a class. If you need more details, check out this free ebook - Beginning C# Object Oriented Programming. We create an example that is used for the Name and Age properties for a Person. So first of all, create a Person class then we will use this class in an executable program. Now, we use this class in an executable program by creating an object of the Person class. It is Visual Studio IntelliSense that automatically shows object properties when we enter the dot (. ) operator after an object. In the following figure we can see Age and Name properties of a Person. Now we read and write values for the property. This line of code is called the set accessor of the Name property in the Person class where we are using the private field mName in the set block, so this line of code actually assigns a value in the mName field, in other words we can assign a value to the private field by property. This line of code is called a get accessor of the Name Property in the Person class; in other words, we can access the mName private field by the Name Property because the Name property get accessor returns a value of the private field mName. So the private field is accessible by the property. When we assign a value to the Gender Property of the Person class object then we get an error that it is a readonly property and can't assign a value to it. So the Gender property of the Person class always returns a value and we can't assign a value to it. We can also create a write only property. A write only property is a property that we can assign a value to but can't get that value because that property doesn't have a get accessor. For example we have a Person class that has the property FirstName that has a set accessor but doesn't have a get accessor so it is a write only property. We can create a write only property when we don't define a get accessor. We can also assign values to properties when we are creating an object of the class. 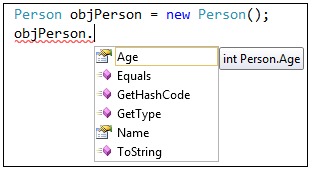 For example when we create a Person class object then we can assign a Name and Age property to the person object. Properties of objects are a block defined by curly braces and in the block each property will be separated by a comma. We can validate a value of a property before it's set to a variable; in other words, we can check a value to be assigned to a private field and if it is correct then it will be assigned to the private field, otherwise it will give an error. Now create an executable program by which we assign an age value of a Voter. Now we enter a value less than 18 and then we get a message with 0 years. In the output screen above we get a message from the set accessor and the value isn't set in the private field so we get a default value of the private field that we already set to 0. Don't be confused by the message and return value. Here set is not returning a value. It is just printing a message on the console before the get accessor calls the Age property. The following picture shows the message shown before calling the get accessor. If we use a value greater than or equal to 18 then we get the private field value without a message. We can also use a property instead of a method that has one parameter and a return value, because we can define custom logic in the get and set accessors. Suppose we have a rule for a student that when a student gets marks greater than or equal to 80 then they get 5 bonus marks and when they get marks greater than or equal to 70 but less than or equal to 79 then they get 2 bonus marks. So we define logic in the get accessor that adds marks depending on the student's original marks and thereafter the total marks (original marks + bonus marks) of the student will be returned. Now create a program by which we can input student marks. Now we enter more than 80 marks and get the total marks with bonus. We can also create auto mapped property. When we create auto mapped property then we don't need define to local private field in get and set accessors. For example we have an employee class which has two properties, one in EmployeeId and another is Name. To define these properties we don't need to create a private field for these two properties and directly declare it. Now we access Employee class property in executable program.